HSSC Group D Recruitment 2018: The Haryana Staff Selection Commission has made a new announcement for recruitment. The candidates are informed that according to the newly released HSSC Group D Recruitment 2018 Notification, there are total 18218 vacancies for the Peon, Belder, Helper, Attendant etc. posts. The application submission has begin 29th August 2018 and the last date is 18th September 2018. 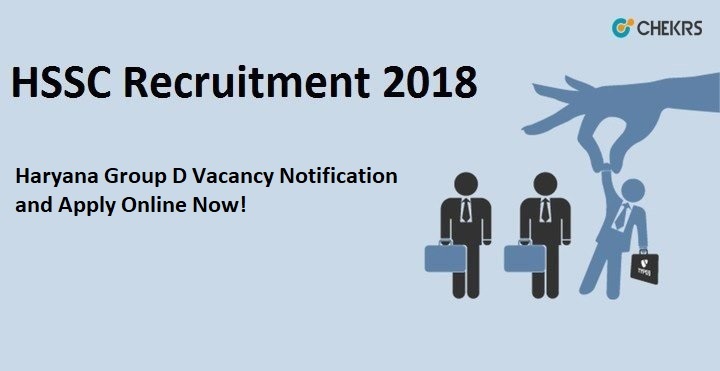 The candidates interested for any of the vacancies can follow the given the details mentioned below such as the eligibility, pay scale, how to HSSC Peon Recruitment 2018 Apply Online and selection process. For new users register themselves yourself on the portal by generating one time password (OTP). Fill the details with right credentials. Remarks: For more information, you can check our website that is www.jobs.chekrs.com and can also get latest update on HSSC Group D Recruitment 2018 . If you have any query HSSC Recruitment that you can write comments on commenting box and take a review or feedback.